Can a sub-£300 display have the best of both worlds? 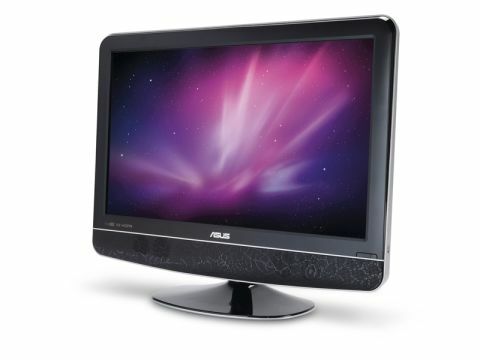 The Asus 24T1E is a combined television and computer monitor. It gives you full HD 1080p, digital (DVB-T) and analogue (PAL/ SECAM) signal support, a seven-day electronic programme guide and 1,000-page Teletext. Around the back there are two HDMI ports and two SCART ports, as well as composite, S-Video and VGA inputs. Annoyingly, there's no DVI support, but you could always get a DVI-to-HDMI lead. Unlike many dedicated monitors, there's no card reader or USB hub, but these are logical omissions given the demands its TV functionality makes on the I/O-port space. As would be expected for a sub-£300 monitor/TV, the ASUS 24T1E won't suit a professional designer or video editor. In our single colour tests, we found the backlight was a little more intense centrally across the screen, leaving darker areas at the top and bottom of the viewing area: nothing that would bother most users, but not pro-quality. More worrying is its poor text rendering, with too much pixelation and not enough clarity. So it's not an ideal workhorse either. Yet it makes a very good media-centre monitor. Its colours are beautifully clear and vivid, its gradient ramps smooth, and it does a great job of distinguishing between almost and actual black and white, even at an angle. Its 7W speakers aren't too bad either. The ASUS 24T1E isn't an ideal computer display, but as a relatively cheap TV and monitor, it's a good deal.